In Newburgh, decades of vacancy have created costly obstacles to redevelopment for many of the city’s crumbling yet architecturally significant buildings. Our primary services at the Land Bank are to remove barriers like environmental contamination, structural instability, and unsafe litter and debris buildup. From our experience, we also know that community development is not just about available housing stock or “fixing” one home at a time. A big element of bringing life to cities is changing damaging perceptions, providing unique experiences and making towns attractive places to live and work. We looked to our neighbors in Albany, Troy and Schenectady – all land bank communities – and noticed they were taking a creative approach. Funded by the Bloomberg Philanthropies Public Art Challenge, Breathing Lights transformed abandoned buildings into art through the placement of light panels in windows. 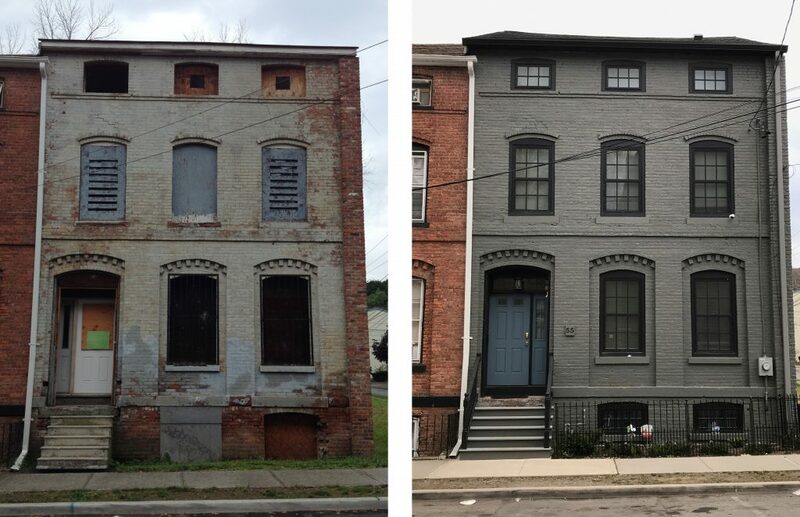 This project sparked conversations about topics central to land bank work, and helped Newburgh Community Land Bank frame how it could use its own vacant spaces in a way that would attract interest to its work, and highlight the inherent value of the neighborhood. In the summer of 2017, the Land Bank launched its Artist-in-Vacancy program, a play on the Artist-in-Residency concept, designed to reframe the idea of vacancy through artwork. An artist working in our office helped us think through this creative vision and tap into the vibrant arts community to establish important partnerships with new and existing residents. Select properties were offered as blank canvasses for creative work that would engage the community and promote arts and cultural production in the City of Newburgh through three initial projects. The projects became a community effort bolstered by incredible local partners – including artists, the fire department, and the city’s skilled workers as well as Habitat for Humanity. For example, a performance piece by Stephen Kwok and produced by Laura Genes came together with the help from the fire and water departments. They also enlisted the Newburgh Elite Track Team as performers. A construction site installation highlighted the work of a local craftsman fabricating the historic architectural details for a sensitively restored affordable housing project. It was curated and directed by Laura Genes, and accompanied by a lecture from architectural historian Andrew Linn. It also included a temporary site installation of industrial plantings by landscape-artist duo Colleen Tuite and Ian Quate. A local furniture company, Atlas Industries, contributed to the design and fabrication of a steel construct to support salvaged stone steps from a recently demolished building. All of these projects opened as part of Newburgh Open Studios and neighborhood tours helped connect the projects to the impact of the Land Bank’s work. The program has blossomed. 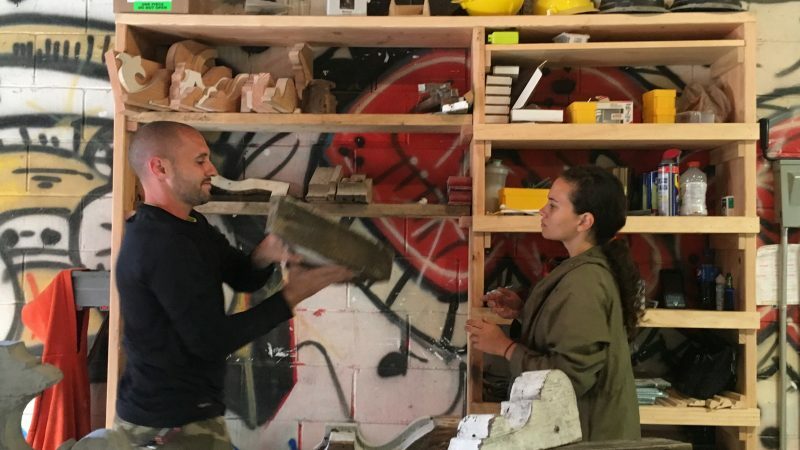 Bolstered by popular support, Artist-in-Vacancy is poised to bring powerful partnerships to downtown Newburgh, including organizations like nearby Storm King Art Center, one of the world’s premier sculpture parks. We have learned that by working with our local arts communities, we have been able to spotlight the potential of more homes and in turn, the potential of an entire neighborhood.